We received a call requesting a quote for a customer looking for a building to house a bucket tractor and a zero-turn lawn mower. Easy access, plenty of room, and a classic look were desired. He thought it might also be beneficial to have a little extra free space upstairs because, well there is just no such thing as having too much room. When it comes to garages and pole buildings we couldn't agree more with that assertion! This post frame structure was designed with a Gambrel Attic truss, which allows for a full upstairs room of 12' wide by 8' high. The customer installed our 3x4 double hung windows in the truss for natural light upstairs, as well as, a cross breeze during the warmer months. The 12' wide split slider on the Gambrel end utilizes the entire wall to open for maximal width. The white roof with white trim makes for a great finished look. We supplied the building kit and a local builder constructed it. 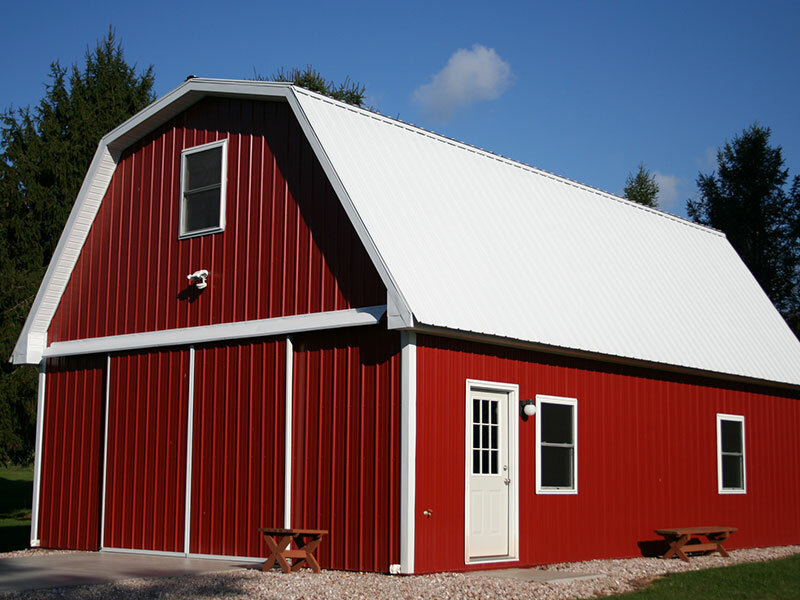 This customer was very pleased with the quality of our in-house manufactured building components (Tuff Posts, Trusses, and Metal).